With the next generation of chess players playing on two boards instead of just one board, it would be nice if the game could be played online. I am a designer/programmer but I don’t have the time. I would hope that if someone was interested, they would take it apon themselves to create the online game. If there was money to be made, lets say in version 2 of the software game, then they could keep it since they created the game according to the rules of the game that I have posted. Of course I would be getting something too. If anyone has any thoughts concerning this please leave a comment, because the people who have played the game really love it! It would make the game more excesable to others anywhere if it was an online game. 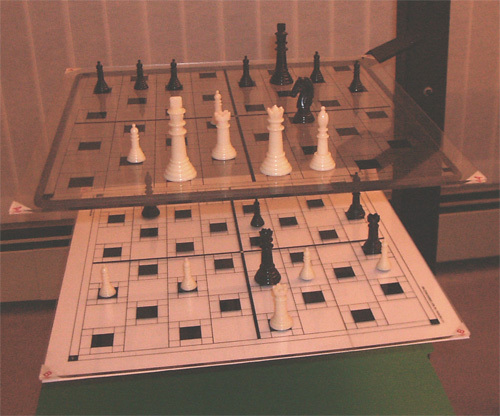 If the software was to be created, it should look something similar to the picture on the left to start with, in other words being able to see all levels with both boards divided into quarters for easy referance. A second version could be made so that the game could be rotated up/down and to the left/right. This two level game takes the same amount of time and same amount of moves as in a regular flat board game of chess. The only difference is, this one looks real cool and is even more fun when playing. One of my friends said that after playing a few games he was afraid he would never go back to regular single board chess. AFTER playing the 1st game with both white and black on ‘A’ level, the Winner Chooses which level he wants to place his pieces (on ‘A’ or ‘B’ level). Then it’s the Losers turn to choose which level he wants to place his pieces. — In-other-words, for each game played after the 1st game, the Winner will always take the action first by placing his pieces on board level ‘A’ or ‘B’. The Loser of the previous game would then take action by choosing which level he wants to put his pieces on. The game would then carry on as normal with White making a move with one of his pieces. This really tests out how good of a chess player you are, because there will be different openings if White is on the top board and Black is on the bottom board. This gives the Loser, a chance for a Rebuttal. What do think? Have you played a game yet? Make a comment. This is myfirst post. I’m just getting use to the possibilities. The reason I’m posting this is because I see that many things out there are just superficial or on the surface. 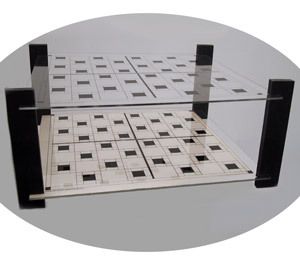 It is much like a board game where there is Width and Length but no Depth/Height. I personally like to get a 3D look at things. Do some research to find out what is said or written is really so. To look at things from different angles. This of course takes time. Take for example the board game of chess. I’ve added the ability for pieces to move up/down which gives the game a dimensional feel. This, in reality makes the game easier although it looks more difficult. Looks can be deceiving until you investigate it and keep an open mind. Notice here that the pieces are on both boards as one game. Life is always more fun in 3D. For more information on how this game really works for yourself and for free, go to my site at: http://www.dimensionalized.com/game/rules4_3d_chess/index.php and there you’ll find all the rules and a free downloadable PDF file of the game rules. Of course to get a real look at things, most pictures are in 2D like the above two. So I’ve also learned how to take pictures in 3D with an ordinary digital camera and then edit it in Photoshop to get the 3D look. 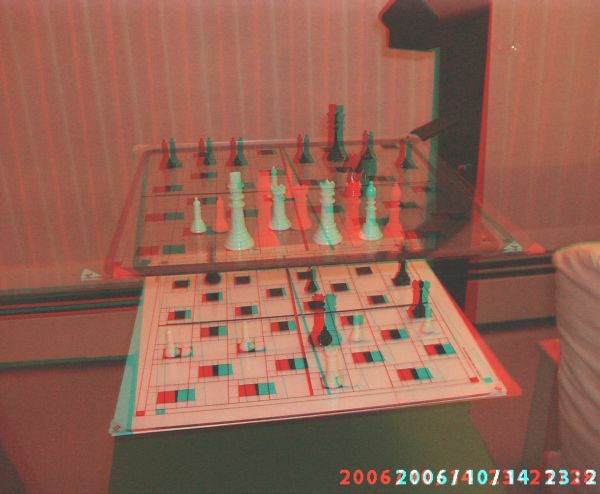 To view this kind of picture you will need red/cyan glasses. You can get these glasses for free if you rent the video “Lava Girl…”. It really is worth it because there are so many 3D pictures online right now. The pictures really seem to jump right out of screen! I’ve posted a few links on where to get free 3D glasses or buy them or how you can make your own 3D glasses. I put the links http://www.dimensionalized.com/im_photos/3d/index.php at the bottom in the middle of the page under Information.